I ran my first 10k race of the season yesterday. The season in Dubai is in winter, as the summer months are far too hot for these kind of outdoor activities. I am not an early morning runner, when I run on my own. I prefer to do my training in the afternoon or early evenings. In too early mornings I am hardly able to put one foot in front of the other. For races, however, I can get myself to get up at 6am. I love the drive on empty roads and the closer I get to the race location, the more I see other racers in their cars on their way. That alone increases my adrenaline and makes me forget the few hours (and by far not enough) sleep that I had the night before. I always have a goal time that I like to achieve. This time, I set myself to finish under 49 minutes, perhaps even close to 48:30. As it was the first race since April this year, I wasn't quite sure were I was standing. High temperatures and humidity that we still have here in Dubai in October (even or especially at 7am) are additional and very unpredictable factors to take into account. I had a really cool bib number: 111. I got lots of nice comments for that along the way. In the end it all ended well. I was right in my goal finishing time. After every race, no matter if the times were good or bad, I realize one thing: I like early morning running races, BECAUSE they are so early in the morning. Before you know it's over. I was back home by 8.30am. I already had achieved something that I was proud of and still had the whole day in front of me. To me, that's the coolest thing. In a small pot, bring quinoa, cinnamon/vanilla (if using) and coconut milk to a boil, then simmer on low heat until all liquid has been absorbed and quinoa is tender (about 10-15 minutes). Add a little more coconut milk or water if the liquid is absorbed to quickly and the quinoa note done yet. Cut the banana in half, mash one half and stir into the cooked quinoa. 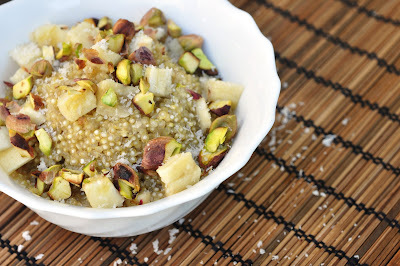 Transfer quinoa banana mixture to a breakfast bowl or plate. Drizzle some more coconut milk over the quinoa. Chop the other half banana. 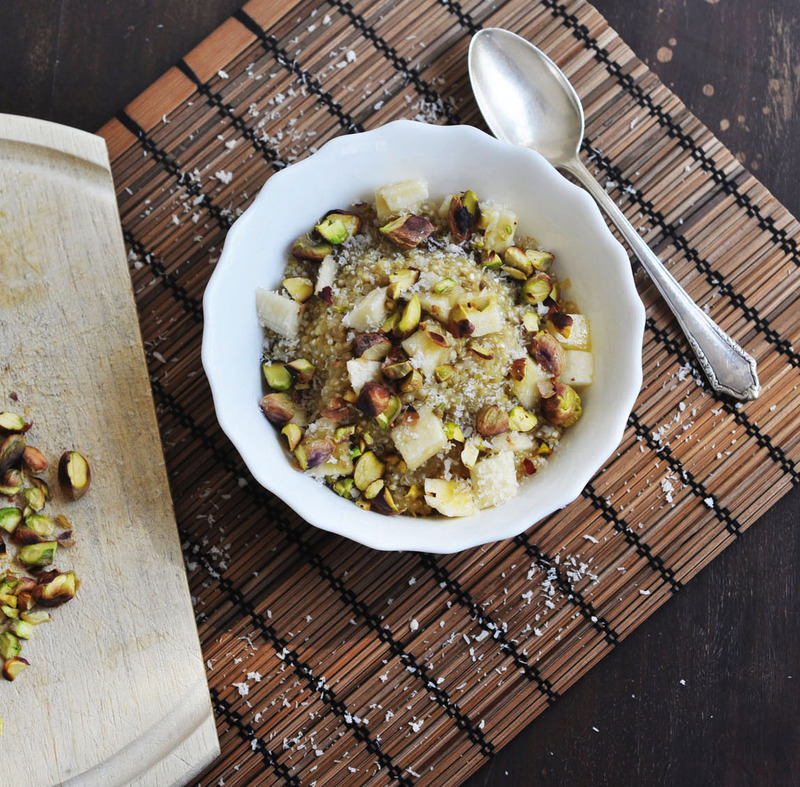 Sprinkle over the quinoa along with the chopped pistachios and coconut flakes. Serve immediately.